In a bid to tackle the devastating floods and herdsmen attacks which have brought untold hardship on farmers and people across the state, Benue State governor, Samuel Ortom, has requested the support of the federal government, organizations, and individuals to enable him handle the problems headlong. Ortom made the request while receiving a delegation of the Indices and Disbursement Committee of the Revenue Mobilization Allocation and Fiscal Commission, led by its chairman Aliyu Mohammed Sokoto. 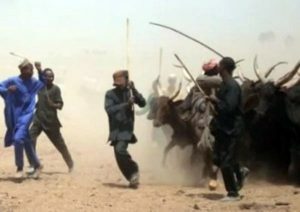 According to the governor, the impact of the devastation caused by the 2012 flooding across the state, particularly the Benue North West and South senatorial districts as well as herdsmen’s attacks in 10 local government areas were massive and far beyond the capacity of the state to handle. He appealed to the committee to at least use one week to go round the affected areas in order to catch a glimspe of the magnitude of destruction and its effects on the lives of the citizens. He maintained that the state required financial assistance and projects that would facilitate the resettlement of those affected, and possible prevention of further occurrence as the case may be. The governor disclosed that the state had reduced the menace of herdsmen and farmers incessant clashes through intervention by security agencies and dialogue between the parties involved even as he said, permanent solution is yet to be achieved. Earlier, Sokoto had stated that the committee was visiting the state in response to several letters from the state government requesting the augmentation of the state’s statutory allocation from the stabilization fund.